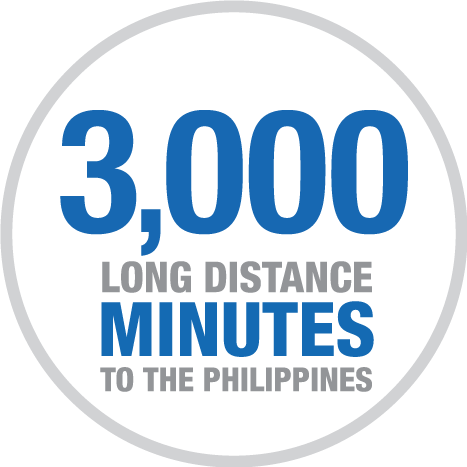 Get 3,000 long distance minutes to five (5) Globe numbers in the Philippines for only $15 a month! Available to Postpaid and Prepaid wireless customers. *After 3,000 minutes are depleted, long distanced rates apply. Postpaid: To subscribe, dial *85 before the desired phone number to activate. Prepaid: To subscribe, Text “KABABAYAN 30” to 3282. Must have sufficient funds in your account before subscribind. Plan will automatically unscribe once the 30 day period is over. The $15k Motion Kababayan fee is not re-occuring. How to register the five (5) Globe numbers? The first five outbound calls to the Philippines with a Globe number will automatically be registered to the Motion Kababayan. When will you be charged the $15 rate? Postpaid: You will be charged the $15 rate once you make your first call using the *85 dialing pattern with the desired Globe phone number. Will the leftover minutes carry over to the next period if they aren't all used within 30 days? The minutes will not be carried over to the next 30 days. What if I don't use the *85 dialing pattern? If you do not use the dialing pattern, you will be charged regular outbound rates to the Philippines. Am I able to change any of the five registered Globe phone numbers? You won’t be able to make any changes to your five registered Globe phone numbers until after 30 days. © 2017-2018 IT&E Guam & CNMI - Explore Your World. All Rights Reserved.